January 25, 2019: Show #283: We've achieved Brownian motion. It's just after 11:00 AM in Del Rio. the BLACK POPE ain't got nuthin on the UNCLE! Greets, UM, and the HD crowd. Del Rio was a great bar in Ann Arbor. vanessa del rio was a great...nevermind. Hooked on Classics set to come up? You can't spell Eumir Deodato without UM! Hi UM! Great first track. I'll always associate this with that pivotal scene from Being There. I loved that scene. The rest of the movie put me to sleep. annie! james! pat! Brian! Aaron! Dean! dave! Sem! Henry! Jeff! Mark! Was this th version used in the movie "Being There" with Peter Sellers? Long ago, somebody gave me the Deodato album on which this appears. I finally got around to listening to it last year. Two for two, on fire. i'm pulling my jeans down for this one! This song used perfectly in the movie Dazed and Confused. Micheal, if we call the voice mail, can it used this week, or do you have to wait until next week? The Three Degrees rapping in 1971 were ahead of their time. Aaron, no promise that any given voice mail will be used...but probably not playing incoming voice mails during the show. Really? You don't think that rap at the beginning was rapping? I sure do. Hey, time to Hink And Dink (no half assed hinking OR dinking)! That riff sounds like an electric mouth harp. Does such a thing exist? Crank up the bubble machine folks! Are you going to have a library set standardized on the show now -- with more on extended fill ins? Shellac was always kind of buggy. Hey, those Covington kids and their Catholic school peers are trucked to DC every year for a right-wing political rally. At least the Church isn't known for a problem with manipulated and abused young people. And in DC, they can buy MAGA caps on every streetcorner. Just like the caps some "very fine people" wore in Charlottesville. It's hard to say, Henry...no plan t this point. My daughter was quite taken with Amoeba Music in Hollywood during our latest visit to L.A. Maybe we'll check out Freakbeat next time. been listening from the kitchen, where I'm cooking up my breakfast but just popped in to say, you're sure delivering the goods this morning, UM! Afternoon! 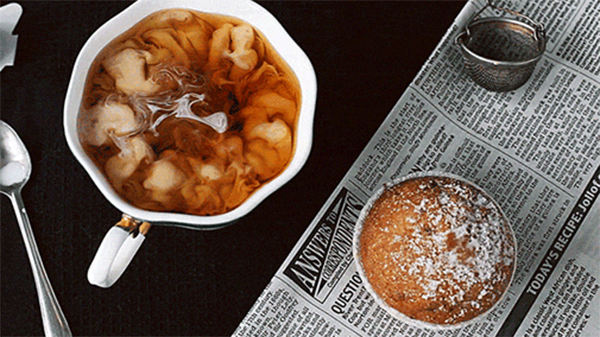 That coffee gif is incredibly soothing. Which I suppose is counterintuitive. Does Amoeba Music offer PseudopodCasts? The restaurant, L'Escargot has got to offer GastropodCasts, surely. Some great tunes today. Really dug hearing The Jarmels - thanks! Not a ABBA fan @Brian? Ah, it's back now. I have a self-healing stream. Brian, does the stream change every Tuesday at 11 for Heavy Metal? you hit the toms and we shout! This is great! @Aaron in MPLS: As a matter of fact, it does! The WaPo says a deal is imminent re a 3-week re-opening of the government. @Brian Money for wall? Surely not. No wall money, they say. Hey, it's Mr. Copyright Term Extension Act! I love how you can sense George on this song. Total George song! Oh, apologies. Not Ringo, at all. Sonny Bono. Did I hear someone playing the bones on Photograph, or were those castinettes? A lot of people confuse them, Brian. Is Ace trying to be Lou Reed here? Why did I choose this Jam track? Jeez. That honking bus? It really struck me when I heard it. You got hit by a bus??! Sounds like re just solo'd over an an orchestra record and someone mixed it poorly...so weird. Thought Bryce's show was pushing Hinky Dinky out of the way. Might be a good idea today. Wasn't it Les Paul who did the first released multitracked recording in 1951? Doesn't seem likely Diz multitracked , though in those days, positioning of the players relative to the mic was crucial to the balance, maybe just lousy engineering. (I was in and out for that track just caught Diz at the end but I trust your sound impressions of it ). THE DEAD! is Donna gonna scream??? Big Smile, the Dead, but sound for all discombobulated, different tracks competing.. .
Ahh, the boys are back. We had a battle of the bands. It was Turtles all the way down. like in the Sturgill Simpson song? Not on this show, annie. Find a place in your heart for them, annie. They knew not what they did. Thanks, UM. See you next time. ok,sem... see ya tomorrow am..yeah, thanks for the show today it was actually pretty good! You know what's so great about the Dead? They are one of the few bands about whom admirers and detractors alike have no illusions. We all hear exactly the same performance. Some of us enjoy it, some don't. I gotta give this more thought. Some credible jazz here. I think this bodes well for the collection, Uncle.